Very interesting to see a Reflections Coffee Can and the butter pat as I've never come across any before. I have to hunt out the auction now to see what the backstamps are, because Reflections is usually on vitrified clay wares. It won't be the 530 range I don't think. Notice how the can has an inner base ring that should fit that saucer that has a smaller well than the usual can saucers. There is no info on the auction re the backstamps. While searching I came across a few butter pats and this one looks smaller as it only fits the pattern. Is it likely to be one of those egg cup saucers? Ev, the 530s, Purple Myrtle etc, have a reduced ring size. The dimensions uno gave me for the can are 6cm H, 7ish across. Unouwanit will have the answers to any Qs about the Reflections. So, do you think this saucer may turn out to be the missing Vision pattern? I won't be holding my breath on this one. Sorry this was my auction. Backstamps are: Crown Lynn New Zealand Vitrified Ware Reflections Pat no 842 on all but the cup, which is simply imprinted with New Zealand. The coffee can had a simple round handle which differs from some of the coffee cans which are a little shaped. (if that makes sense) ? Looking forward to sending it to a new home. Editing to add this is the smaller butter pat than the commonly seen. I've only found this size in the reflections thus far and one in Blue to match the blue saphhire range. It looks as though you got it right, concluding they belong together, especially as you bought them together. Read through to the end. I have a spot ready and waiting for this set. How disappointing to see the Viking cans are plain colours .....? But then again these could be that range of plain coloured cans that Jeremy has ....? It will be interesting to see the backstamps and to compare to see if the cans are the same shapes as Cook & Serve ones. Good luck Jeremy ! I only had Yellow and Olive from memory. Nothing fancier than that. I have one remaining set with the yellow cup I've just pulled out of the shed and offered to Jeremy, I was trying to compare it to the recent reflections one and they are so similar, shape is spot on but the rim on the base differs. So Jeremy when you receive it would you mind taking a photo of the base to confirm that? Five Focus Pat No 878 cans on tango blue saucers. Cans not marked. Saucers green Cook & Serve stamp. I paid a huge sum for these in a trademe auction. Reflections d842, one saucer only. Note that although this is a 792 saucer it is not marked Cook & Serve. Green Cook & Serve backstamp. I knew I had a green saucer somewhere. Found it in my glues bucket. I had to photograph this outside to make the colour true. 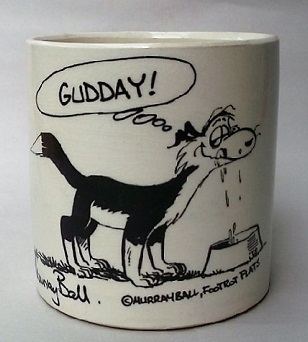 It's either very dirty or lost glaze. I've tried solvents; abrasives are next. I have no idea what can should sit on this, maybe green bamboo, or something totally unexpected. So, one new patterned duo out of the blue, and some more cans to watch for. Less than a week has passed since this post, and just over since I took possession of the 792 Reflections saucer, not even dreaming that such a thing would exist, especially as Reflections was made in the 3618 shape. Well, now I have found and bought a 782 coffee can to match the saucer. Don't hold your breathe though. It is in Auckland and I am in Whangarei. It could be weeks or a month. I have had a few disappointments with the post and couriers and do not feel like taking a chance on losing this amazing and apparently very rare find. 18/6/14. Now I know what the green saucer is for, and what a surprise: Napoli! And I finally picked up my 782 can and matched it to its saucer. Just the one. I was hoping to work out a date for this, thinking it preceded the Cook & Serve range but I'm pretty sure now after re-reading Val and studying her source material that 1963 is THE first year for all the vitrified cans. 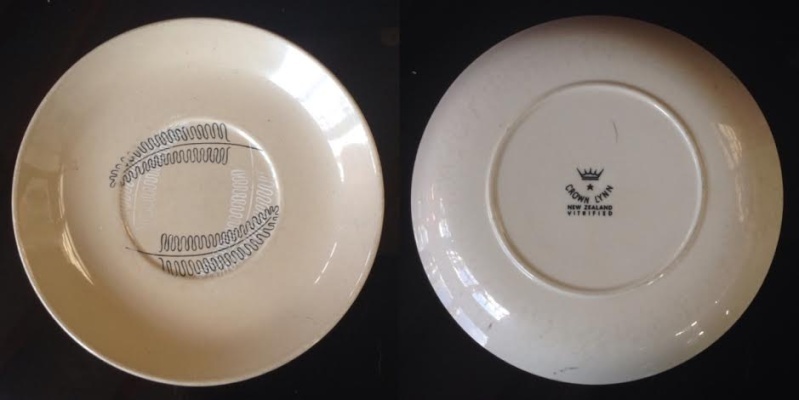 It has a vitrified star stamp on the saucer so it is not part of the Cook & Serve range. 782 left, 3618 right: these differ only in foot ring and mark. 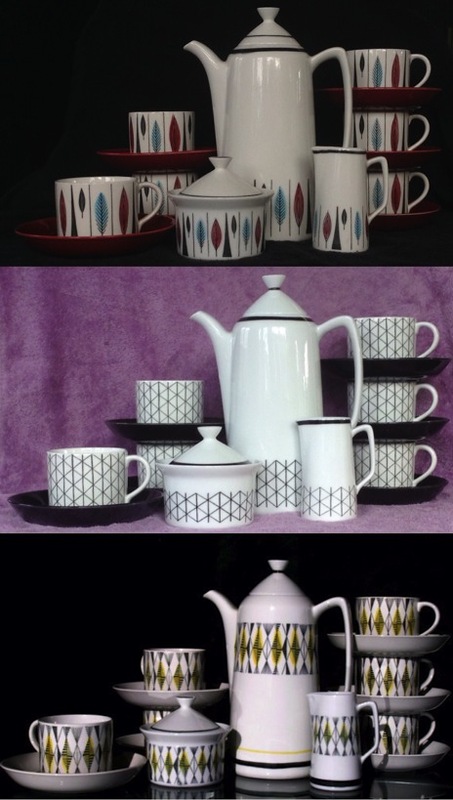 I already had Rorstrand Venezia pattern cans and saucers so I couldn't resist when I saw the coffee pot, creamer and sugar on trademe for $8! No one else bid so that's what I paid. Actually it cost me more because I didn't trust it to the post and drove to Auckland to pick it up (along with the 782 Reflections). 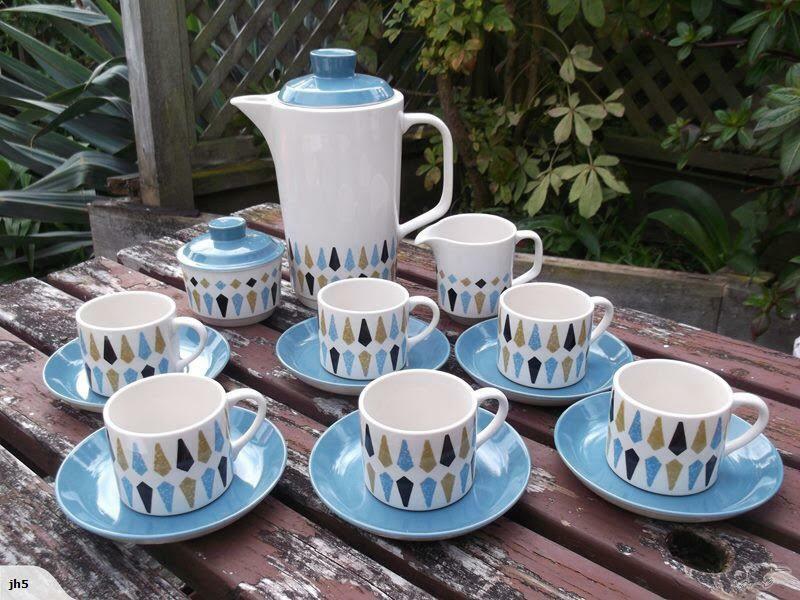 No worries: this Venezia set is worth hundreds of US dollars on the international market. They don't come up for sale as a full set often. 27/6/14 I've added a new photo here and taken one out from above. The top is my "Tango" set. This is the pattern Crown Lynn reproduced as "Vision". Note the original red saucers. Sometimes seen on black. Later ones have a white saucer with a black ring. I suspect an earlier coffee pot and sugar bowl may have had red lids, but I'm just guessing. The middle set, highlighted in purple, is the "new" Venezia set. Bottom set is "Curtis". 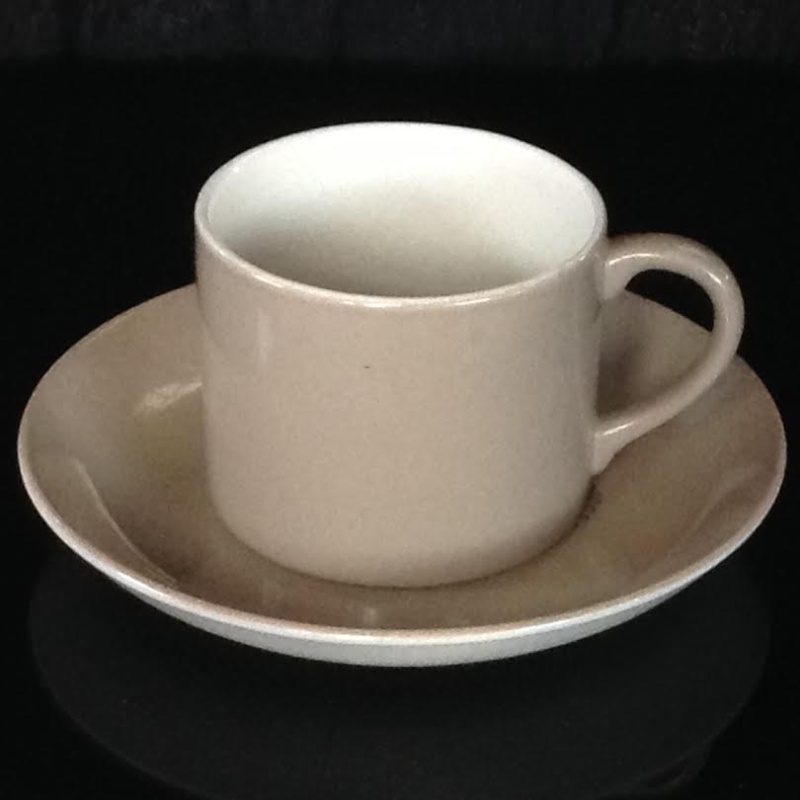 I posed my photos to look like this one, which is currently for sale in an etsy.com store for NZD530: https://www.etsy.com/listing/129414751/rorstrand-curtis-atomic-era-coffee-tea from etsy. I see this Curtis set is still for sale at etsy, however ... I don't know whether exchange rates can account for this but the price is now $984.03 NZD, up from just over 500 to nearly a grand! As it is a while since I posted my different coloured cans and I now have some new ones I thought it time for an update. Cook & Serve yellow, yellow, lime green, tango blue. 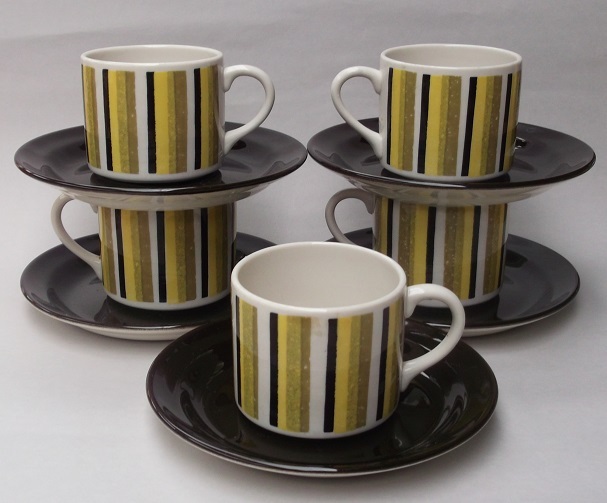 White and lime green came on Form saucers as complete sets. The mushroom one is a Reflections can and belongs on a Reflections-patterned saucer. I believe some of these belong to Viking sets: brown, oyster, yellow. 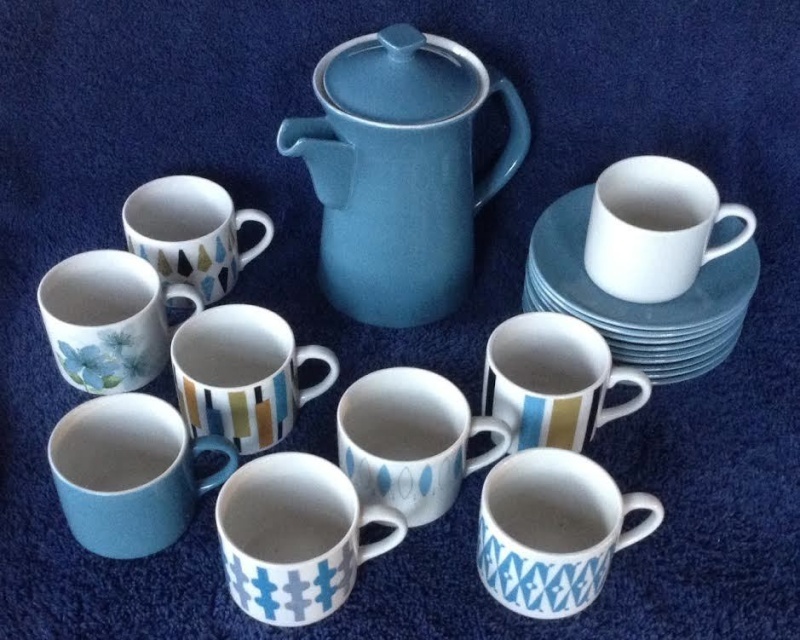 The two standard Cook & Serve colours, tango blue and yellow, bottom row each end, were found without saucers. None of these coloured cans has a backstamp, however all but white and mushroom have impressed numbers which are hard to make out. Oh no: sorting through my cans today I noticed that (without even including the Oystery colour) there are actually THREE distinct shades of yellow on coffee cans! My photo has not captured the differences so well but they are distinct to the eye. From left: Cook & Serve Yellow, Primrose Yellow, Chrome (or Cadmium?) Yellow. Bidding on cans on trademe has gone wild. I participated in a couple of auctions recently that went over $150 for five sets, passed on the Fleurette as I have some and the other bidder seemed pretty intent on winning, but could not walk away from the Focus as I had none. 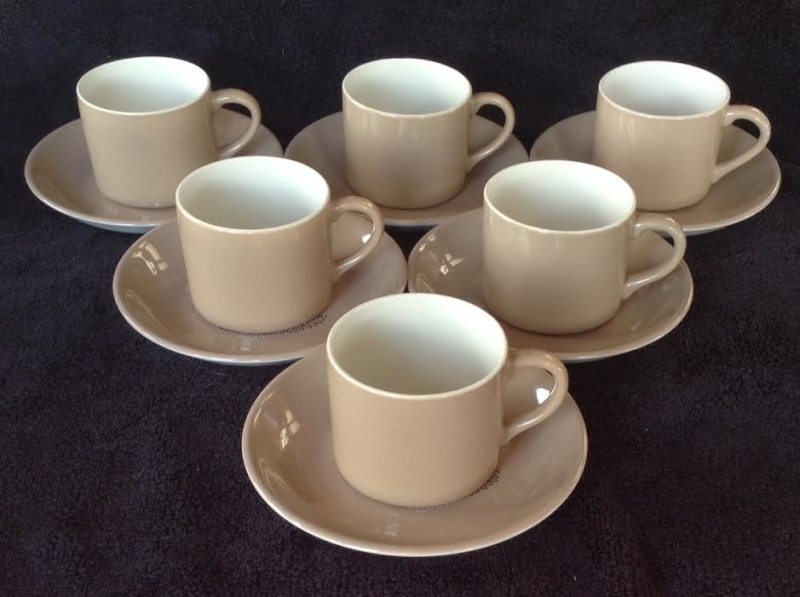 I was a bit unsure about the pairing of named cups with star-stamped saucers, and about the saucer colour, which does not pick up any of the colours on the cans. 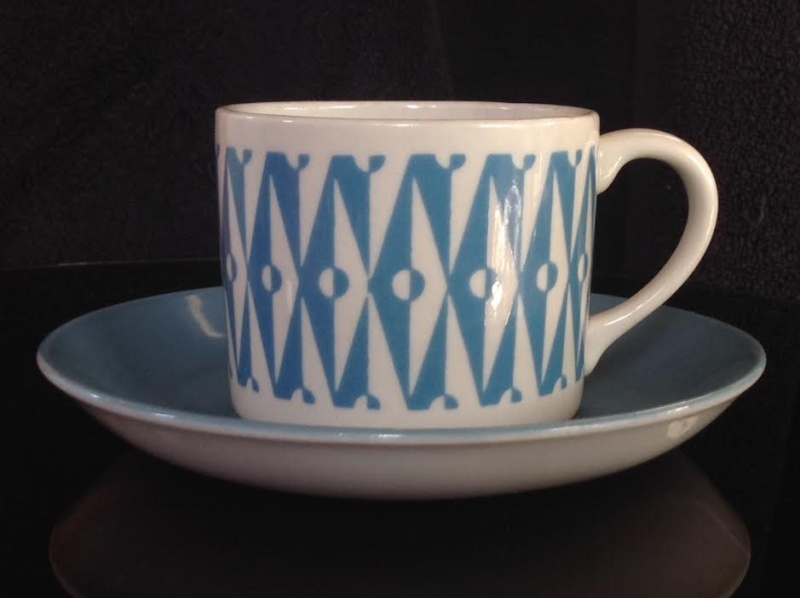 It was Ev I think who noted having had a set of Napoli on brown saucers and I feel that is correct. 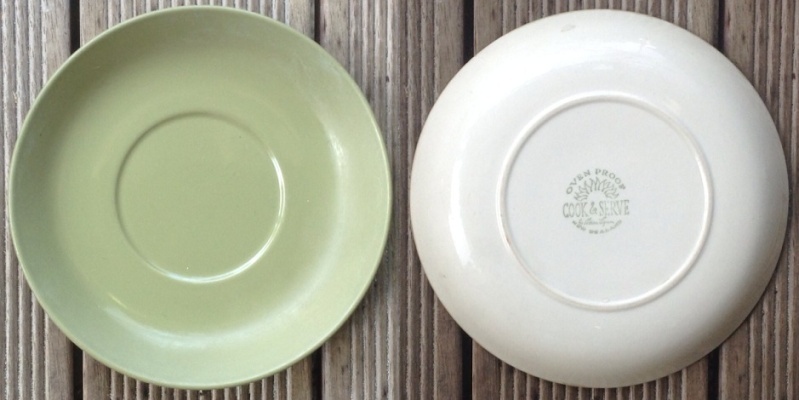 I have the one green saucer, noted above, but it has a Cook & Serve stamp, so I'm still wondering whether there is another pattern, maybe two, on green. I would have liked at least one such saucer as the only star stamp one I have is my Reflections. BTW a single Napoli without saucer recently sold for $45. I will be interested to see what they go for. Is it just me or is this another Coffee Pot that I can't find? Maybe it's just the colours that are putting me crook? Ev, I assumed it was Forma, or is that Shape twenty-5?. I haven't checked. John, jh5, has given me permission to use his photo. Yes it's Shape 25 Jeremy and isn't that just so pretty !! Is that a lighter shade of blue saucer than the Tango Blue Jeremy? I'm not aware of another shade of blue Ev. Must be the light. I said Forma first because I think that is the shape Auckland Museum has but I'll have to check that somehow, forgot which pattern it is, forget where my Museum pics are. The cans make the pot look really tall. I like. Amazing to find 5 Saraband coffee cans in a favourite opshop today for 50c each and then was told that all the bric a brac was half price ...... my word did I feel rather lucky! 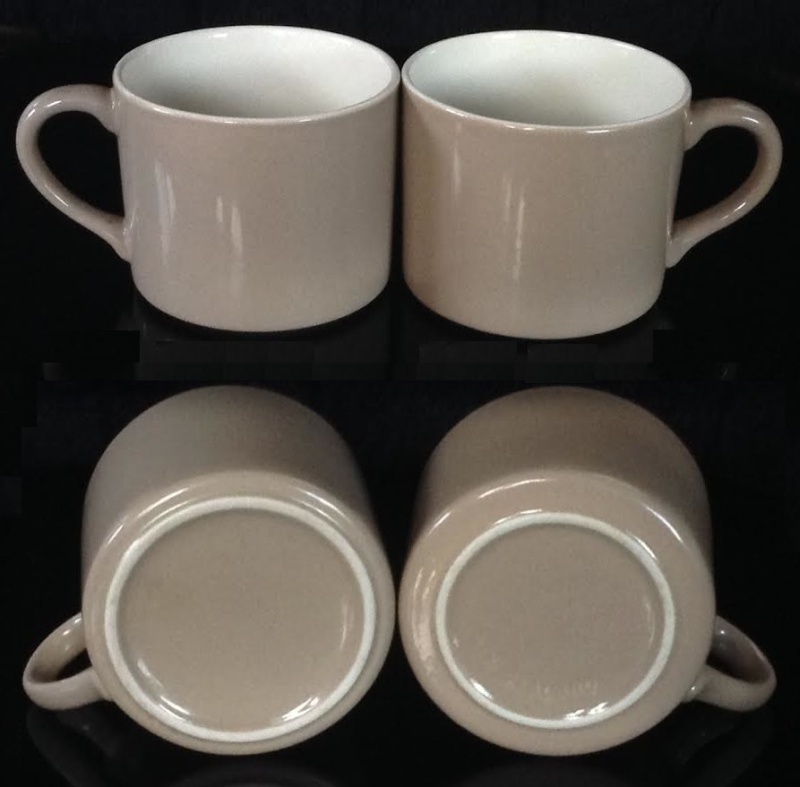 No saucers, so I teamed them up with dark brown rimmed saucers for their portrait.